Mueller takes over citing that he wants to gain back the trust the company lost and also intends on implementing some strict compliance standards. The board had to decide on ways to save the company from landing into serious losses, and Mueller looked as the ideal choice. Mueller has been associated with Volkswagen for many years, working under the Audi department since 1977. The company’s supervisory board chief Berthold Huber said that he “knows the company and its brands,” to tackle the crisis. 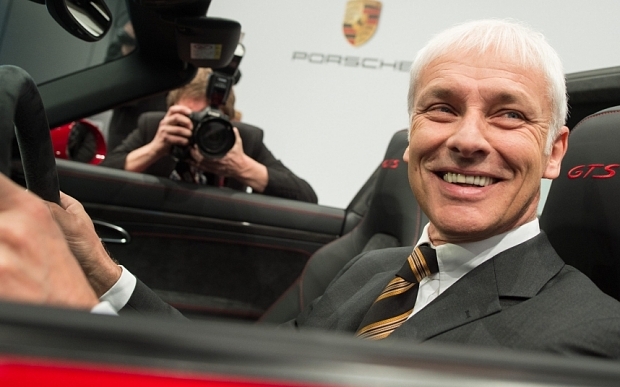 Mueller led Porsche from 2010 and since then the company has seen record revenue and profit, with deliveries jumping 17 percent in 2014 from a year earlier. Yet, Mueller will find it a tough task to bring this sinking company back above sea level. His first order of the day will most likely be to steer the company through the potential law suits and multi-national investigations. Norway, Australia, France, Britain, and India are attacking VW from all sides, investigating affected cars in that area and looking to add to the company’s ever growing list of law suits. Private law firms are also lining up to take on the German company with a Seattle law firm already filing a class action law suit. Will Mueller be able to salvage what remains of the company’s reputation and build anew? Only time will tell. Follow this space for more on the VW scandal.